Marquez tops crash filled final day, Viñales fastest overall. 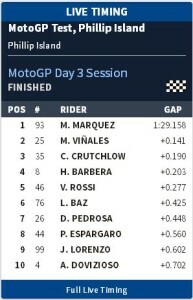 The Phillip Island Test comes to a close with Marquez topping Friday times but Viñales holding the top spot. 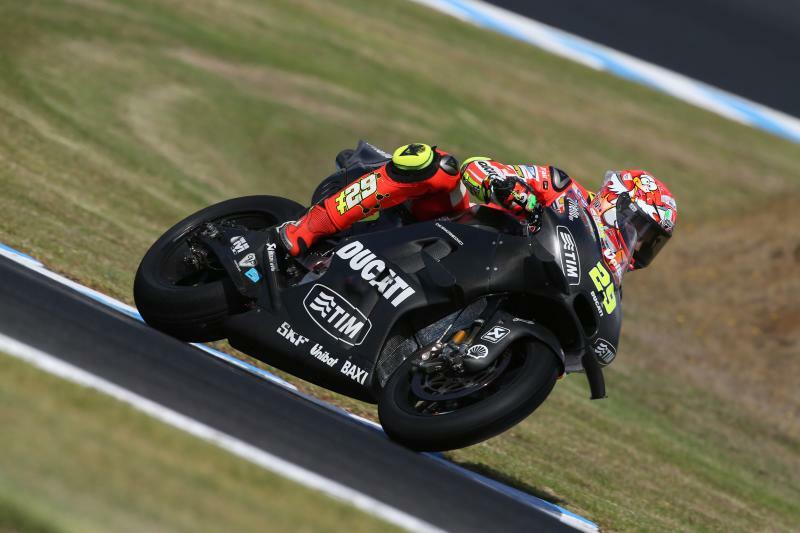 The final morning of testing at Phillip Island got off to the best start of the three-day test with clear conditions allowing riders to immediately get out on track. Although clouds loomed in the distance, the top seven riders were able to get below the 1’30 barrier within just a handful of laps. Loris Baz saw one of the biggest improvements, the Avintia Racing rider’s early time already half a second faster than his best from Thursday. As riders pushed harder and harder to improve their times a number of falls occurred. Tito Rabat was the first, the MotoGP™ rookie falling at the incredibly fast Turn 1 before being taken to the medical centre for checks on his left wrist. No injuries were reported for Rabat, but in the meantime his Estrella Galicia 0,0 Marc VDS teammate, Jack Miller, suffered a fall at Turn 6 with Thursday leader, Maverick Viñales unfortunately following soon after. Both were unharmed, but Viñales’ Team Suzuki Ecstar GSX-RR sustained heavy damage. There was also a fall at Turn 2 from Pol Espargaro, the Spaniard was unharmed and was the fourth fall in the first two hours of the day. Difficulties continued for the Suzuki team as Aleix Espargaro also fell at Turn 6 and although he was unharmed, rain soon set in on the circuit and limited his track time again. The weather caused a delay of over two hours to proceedings with Scott Redding the first rider to head out as the track began to dry, the Brit returning to the pits immediately. With just a few hours of the final day of testing in Australia remaining, the circuit was suitable for action once more. Yet more falls followed as Tito Rabat had his second crash of the day, this time at Turn 4. Again he was uninjured. Aleix Espargaro also had a second crash at Turn 4, with Bradley Smith sliding off at the tight corner and reporting some discomfort in his shoulder after. Turn 4 continued to claim victims throughout the afternoon with LCR Honda’s Cal Crutchlow coming off. Late in the day there was a brief red flag as Danilo Petrucci crashed at Turn 8, the Italian heading to the medical centre with right wrist pain. The Italian was later diagnosed with multiple fractures in his right hand. Fellow Ducati rider Eugene Laverty crashed with 45 minutes remaining, the Aspar MotoGP Team man avoiding any serious injuries having only just returned to full fitness after his Sepang crash. With just over half an hour remaining, Jorge Lorenzo suffered a fall at Turn 10, suffering no major injuries and walking back to the pits. Marc Marquez also suffered a fall without consequence in the final minutes of the test. Leading the timesheets on Friday was Repsol Honda Team’s Marc Marquez who was 0.141s clear of overall leader Maverick Viñales. A late charge put Cal Crutchlow third in the dying minutes of the test. One of the most impressive results of the day came from Hector Barbera in fourth with a 1’29.361s, he and his teammate Baz, in sixth, were split by Valentino Rossi. In seventh, Dani Pedrosa made steady improvements throughout the day to end ahead of Pol Espargaro and Jorge Lorenzo, Andrea Dovizioso rounded out the top ten on Friday and was 0.702s back on Marquez’s best time. Thanks to his stunning 1’29.131 on Thursday, Maverick Viñales leaves the test as the overall fastest rider ahead of Marc Marquez. With less than 18 minutes to go on the final day, LCR Honda’s Cal Crutchlow set the third fastest time of the test. Despite a difficult third day, Lorenzo leaves Australia as the fourth fastest rider just 0.004s ahead of Hector Barbera who proved that the GP14.2 is still competitive despite being several generations behind the factory bikes. Rossi’ s 1’29.404 from Thursday sees him end the test in sixth, continuing the strong form the factory Yamaha team have shown in recent tests. The second fastest Ducati at the end of the Phillip Island test was Loris Baz on the Avintia Ducati, a new seat unit allowing him to get comfortable on the bike and end the test seventh overall. Dani Pedrosa ends the three days with a best time of 1’29.606, 0.023s back on Baz . Rounding out the top ten on combined times, Pol Espargaro and Andrea Iannone both completed significant distance on their machines over the three days. Iannone was closely followed by Ducati Team teammate Andrea Dovizioso with Octo Pramac Yakhnich’s Scott Redding just behind. 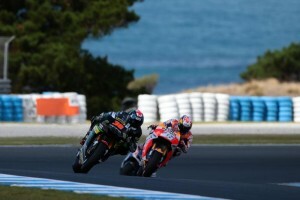 Fellow Brit Bradley Smith leaves Phillip Island in 13th ahead of Wednesday’s leader Danilo Petrucci and Jack Miller, the Australian rounding out the top fifteen on his return from injury. Tito Rabat ends the test in 16th but within a second of the fastest time while Aleix Espargaro finished a disappointing 17th ahead of Aspar MotoGP Team duo Yonny Hernandez and Eugene Laverty. Takuya Tsuda rounded out the top 20. 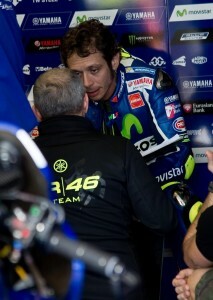 MotoGP™ riders and teams will be back on track on the second of March for their final pre-season test in Qatar.